Oops - we don't appear to have a video for the CR-180II. With a duplex scanning speed of 180 cheques per minute (American cheque format), the Canon CR-180 cheque reader is up to twice as fast as other compact cheque scanners. You can choose from among five types of black/white and greyscale scanning modes, and four levels of scan resolution (up to 240 x 240dpi). When you're ready to start scanning, load up to 200 cheques on the feed tray at once. The Canon CR-180 cheque reader reads the MICR line with a high precision Canon magentic reader, an can also read this data simultaneously with OCR software. In addition, the Scanning Utility software lets you save MICR data in different ways: as the file name of an image, in a TIFF file tag, or in a log file for reference. This scanning mode offers clearer black and white scans of cheques printed with illustrated or light coloured backgrounds. With normal scanning, such as design elements may lead to images in which important information is obscured. By contrast, Canon's exclusive image processing technology detects where the letters on the page are and emphasises them for improved visibility. Feliable feeding is absolutely curucial to efficient job completion. And that's where Canon expertise with document scanners makes a difference. The Canon CR-180 cheque reader allows you to adjust the feed mechanism to match the thickness of your documents, which ensures that each document moves smoothly into the scanner. Duplicate forms can be fed as well, by turning off the paper separation mechanism. If two cheques get pulled inot the scanner at the same time, you'll be warned right away. 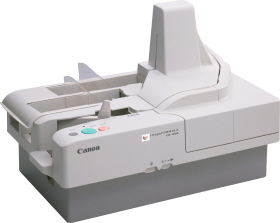 The Canon CR-180 cheque reader can be set to detect double feeds either by the thickness or length of your documents. The Canon Scanning Utility application software offers scanning, file saving, image viewing, pring and various other functions. The ISIS/TWAIN diver is bundled and a software development kit is ready for customising scanner operation.